I have recently had the pleasure of getting to know an amazingly strong woman who's story is truly inspirational. I would like to introduce you all to Painter Sam. Samantha Bennet is an artist currently living in Columbus, Ohio. She paints a variety of subjects including our favorite: Dogs, more specifically Pit Bulls. Samantha's passion for art began when she was just a child, in the hospital. When she was 9 months old, she was diagnosed with bacterial meningitis that threatened her life but she lived. The impact that the disease has had on her body is evident. She is missing fingers, toes and half of her right foot. She has had over 25 corrective surgeries and is still having them today, 38 years later. Despite all of this, she has not let is stop her from doing what she loves, Art. She has been exhibiting her artwork and donating proceeds to The National Meningitis Association. 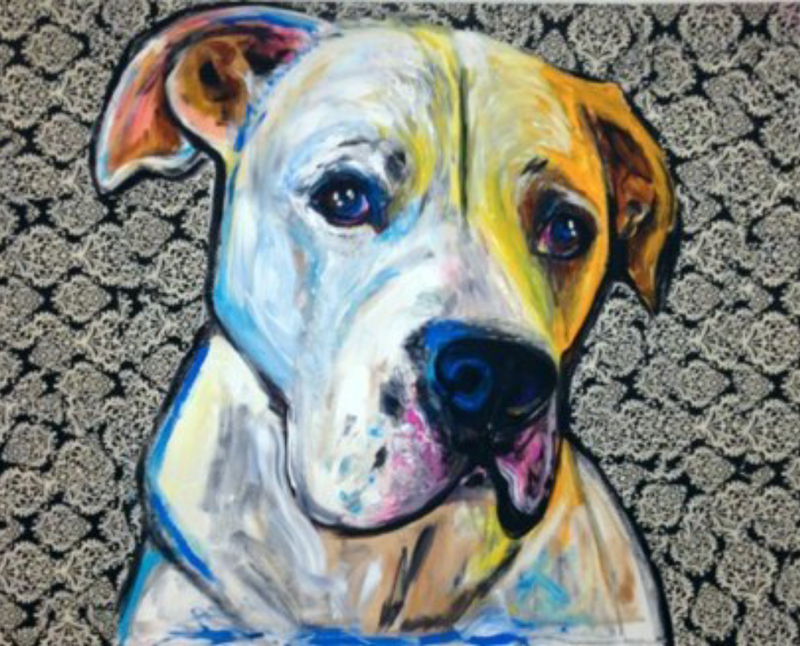 One of the subjects that she painted for a show was her very own dog Duke, an American Bulldog and Pit Bull mix. She wanted his true personality to shine through in her painting and not for people to dwell on the fact that he was a Pit Bull. Following this exposure, Bully lovers have shown great interest and are supporting what she does by having Samantha paint their very own dogs. Sadly Duke has passed away at the age of 11 but he still inspires her paintings to this day and has also inspired her to raise money to help save Pit Bull breed dogs by donating proceeds of her exhibits to rescues. We feel that Samantha has something in common with the Pit Bulls that she paints. They are both strong and beautiful and full of life. Most times humans choose to discriminate based on outside appearances and typical stereotypes. Seeing the perseverance of certain people to make a positive impact in the world is not only encouraging but shows so much selflessness. This is why we admire Painter Sam, she has not let anything discourage her from doing what she loves, spreading awareness and donating to the cause. Beautiful! We tip our hats to you. "My scars are my story and I am proud of them. I embrace the curious stares of strangers. Most of all, I hope they look as intently at my art and see that I am following my dreams."